#165: Saints Alive | mark Joseph "young"
This is mark Joseph “young” blog entry #165, on the subject of Saints Alive. I usually avoid issues that are denomination-specific. I don’t want to fight with other believers but promote unity and love between us. This, though, seems to have crept up on me. 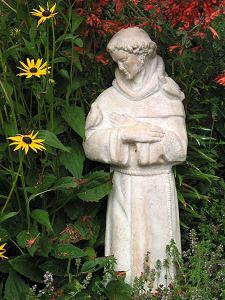 It came about because my wife decided she needed a statue of St. Francis of Assisi for our currently non-existent back yard garden, and found one online (not the one pictured) which we could have for a song and a long drive. She has never been Catholic; she was Lutheran for many years until God moved her to a Baptist church, and although she is still more liturgical than I she shares much of my interdenominational attitude and experience. There seems to be a story connected to this. St. Francis means little to me and only connects to two stories, one a legend about a wolf who agreed to a vegetarian diet so he could live with the friars and their animals, the other a joke about the unluckiest man in the world. However, one of our long-term houseguests was raised Roman Catholic, and during his brief ill-fated marriage to a conservative Baptist girl made the mistake of bringing home a statue of St. Francis for their garden. She was so upset by this that she had her father come read him the riot act for this act of pagan idolatry, and I think maybe our statue is here to say that not all Christians are so unreasonable. However, I don’t really know why we need this statue, other than that it is apparently part bird bath (although she also wants a bird bath). It was going to rest on our front deck for the winter, but then someone was concerned it might be stolen or vandalized, so it is now decorating our living room. I would be more concerned, I think, had I any expectation that our guest was likely to pray to this icon. I don’t think he does very much praying, and certainly not when he is not in trouble, and probably not when he is. I do, however, realize that there are a lot of nuances and complications here. The Roman Catholic Church officially states that people do not worship saints; they venerate them. That’s a word that most people don’t have in their vocabulary, but some Dungeons & Dragons™ Dungeon Masters will recognize as the verb form of the adjective “venerable”, the oldest age category for character races in the Dungeon Master’s Guide. To venerate, to revere, is to show someone well-deserved respect of the highest order. That appeals to me. There are believers I genuinely deeply respect, and not all of them are living people whom I have met. If you tell me that St. Francis of Assisi, or St. Teresa of Calcutta, is someone deserving of such respect I can at least understand that, whether or not I share that respect. However, one point that is worth noticing is that just about anyone I think deserves that kind of respect does not count himself worthy of it. It is something of the enigma of veneration: anyone who thinks he deserves it is disqualified. That doesn’t mean you necessarily deserve it if you don’t think so, only that thinking so is arrogance of a sort that does not fit the character of the person who deserves it. The people we most admire for their faith generally do not think themselves all that admirable, or at least don’t convey the impression that they do think that. It makes it difficult to know who to venerate, as just about anyone who might deserve such respect to whom you offered it would reject it and turn your attention toward Jesus. Maybe, though, it is different when you have entered heaven; maybe there are some among us who are regarded more highly in heaven than the rest, and have had to accept the burden of being special. It is the next part, the part where people pray to the saints, where we start getting into trouble–but the trouble is complicated. Let us first establish that most people do not confuse the statue with the person. That is not an impossible mistake to make, and there are people who appear to make it, traveling great distances to visit specific statues or shrines where miracles have been reported, thinking that somehow the statue is, or contains, the presence of the person here in the world. For most people, the statue is not different in kind from a crucifix or even a cross–a reminder, a focal point, a way to keep in mind the person being addressed. It is not in that sense different from the person who comes upon a photograph of a deceased or absent family member and speaks to it as if it were that person–except, of course, that the person speaking to the saint in the presence of the statue assumes that the saint can hear. But the request is being made to the saint, the departed believer, and not to the statue. If that is clear in the mind of the person making the request, we eliminate one of the problems. Of course, it still is not that different from idolatry. Certainly there were ancient worshippers who believed that the statue or carving was itself the deity, but in the main most pagan worshippers understood that the statue was just a statue, a marker of the presence of the deity but not the god itself. Worshipping a statue and worshipping a spirit whose presence is indicated by the statue are both idolatry–but then, so is worshipping a spirit who is not God. There is a fine line between veneration and worship, since the former means showing respect for the object/person and the latter means expressing reasons the object/person ought to be revered (worth-ship), but let us assume it is possible to stay on the right side of that line. C. S. Lewis explored the issue of prayer to the saints somewhere, and his analysis was interesting. He noted that asking St. Francis, or St. Teresa, or any other departed believer (he did not name anyone specifically), to pray on your behalf is not different in kind from asking your pastor, or your spouse, or your neighbor to do so. It seems rather straightforward, really, when you put it that way. The problem he advanced as fatal was the issue of knowing which persons actually are in heaven. That is a certainty we cannot have about anyone other than Jesus Himself. We might carry the ninety-nine-point-nine-nine-nine percent out to the hundredth decimal place, but it is not actually given to us to know that Peter or Paul or Mary–or Francis or Teresa–is in heaven. I am very confident that my sainted grandmother is there, less confident of others of my relatives, but I could not say with absolute certainty that anyone I have known is in heaven–I do not see the heart. I am completely confident that I will be there, but my confidence is not something I can give you, and I have been known to be mistaken about some facts in the past so I might, in theory, be mistaken about any of them now. We don’t really know who we can ask. We have the additional problem that we don’t know how we get from here to there. Are our departed loved ones already experiencing heaven in what we call real time, concurrent with our continued lives here on earth? That is a possibility popularly embraced. However, some hold to the notion of “soul sleep”, that we who die remain unaware of the passage of time until we are awakened on the resurrection day and all enter heaven together. That would mean that Jesus is in heaven, but Peter and Paul and the others are still waiting, unconscious of the wait but not yet there. There is also the possibility that neither of those is quite the reality, but that at the moment of death we leap across time to the moment of resurrection, not “sleeping” anywhere but simply skipping whatever time remains in this world to enter eternity on the day of a resurrection still in the future for everyone else. In those cases, it does not matter who is going to enter heaven–no one is there to hear us yet. Prayer to the saints also assumes that those who are in heaven are listening to those of us who are on earth. We imagine that they are for a couple of reasons. One is that from our earthly perspective, if we were to be taken from our loved ones and moved to heaven, we would be very interested, even concerned, with what was happening to them here on earth, and so would want to watch, listen, keep aware of their situation. The other is that we want to believe that those who have left us love us enough that they would want to know what is happening to us. Both of those points ignore the possibility that someone who enters the presence of God might have something far more significant to occupy his attention for the next few thousand years than what is happening to the people he left behind. Having finally stepped into the actual immediate continual tangible presence of God, am I going to be wondering how my granddaughter is doing? That’s possible, but somehow not likely–and I tend to think we would very quickly lose track of time, particularly if we have stepped out of time into eternity. Let’s suppose, though, that it is the case that my grandmother wants to know how I am doing. There is yet the question of whether heaven actually provides the opportunity to watch–as if it were the observation windows above the operating theater where students can observe the surgeons at work. We are never told that the departed know what we are doing. In fact, the one documented instance in the Bible of someone speaking from beyond death, of that of Samuel to Saul, suggests that Samuel had no idea what Saul was doing, and had to figure it out when it happened. So the assumption that the departed can hear us is itself questionable. But even if we grant all that, there is yet the question of why they would be listening to us, specifically. I can imagine that St. Teresa of Calcutta might be intimately interested in what is happening with the Sisters of Mercy order she founded and the work progressing in India (and as we recently noted, it is getting more difficult for Christian work in India). I might even suppose she is interested in my close acquaintance Dennis Mullins, who on one occasion some years ago wrote a song for her and presented her with a copy of the recording. It is a far stretch to suppose she would be interested in me–I never met her, never directly supported her work, probably never prayed for her during her ministry. It is an even farther stretch to imagine that St. Francis has any particular interest in me, and the fact that I will be one of millions to erect a statue of him in a backyard garden probably does not impact that significantly. I think, though, that there is a fundamental problem with our attitude when we pray to a saint. The notion we have is that somehow they are more worthy, more likely to receive an answer to their prayers than we are to ours. It is a mistake. If we ask our pastor to pray for us because we want someone to pray with us, that is perfectly reasonable; if we want him to pray for us because we somehow think that Jesus is more likely to hear and answer his prayers on our behalf than our prayers on our own behalf, that is not humilty, it is error. God wants us to bring our concerns to Him ourselves, and Jesus is given to us as the “one mediator between God and man”. When we ask others to pray “for” us we are using the wrong preposition; we should be asking them to pray “with” us, to agree with our prayers, to support us as we pray. We are invited, encouraged, even commanded, to pray to God through Jesus Christ. If we will not do this, our prayers to anyone else, living or dead, are not going to be of much use. If you ask me to pray with you, I will gladly support you in prayer; if you ask me to pray for you, the best I can do is pray for whatever I hope God will give you (which might not be what you are asking), or perhaps that you will be able to find whatever it is that will enable you to pray. God will hear your prayer. To pray to the saints is to presume that God does not care enough about you to listen, and that someone more worthy than you needs to mention you–like having a friend who has God’s ear. You have God’s ear, and no one is more worthy than Jesus Who makes you as worthy as Himself. So respect believers who reflect this, but make your requests known to God directly. And don’t make a big deal about lawn ornaments. A reminder in the middle of our garden of a man who cared about our relationships with God and with nature is not a bad thing, and a better thing if it reminds us that God cares about our garden more than we do, and loves us, and hears when we pray.